Well wait no longer! The Bacon Boardgamers are proud to announce the opening of their new board game library. 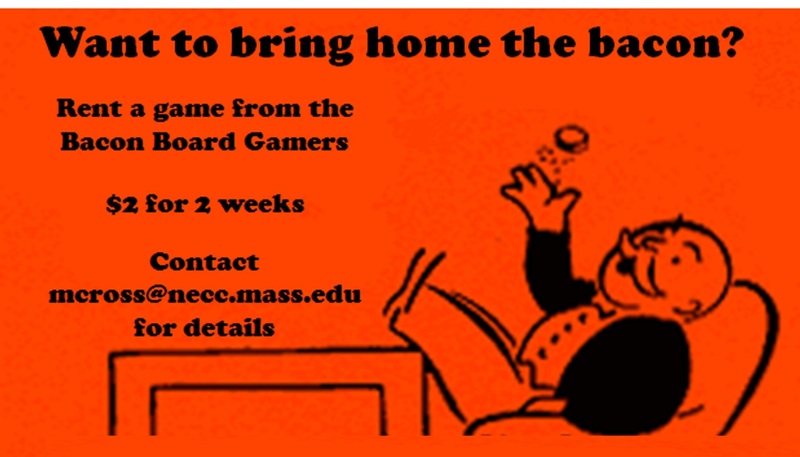 For a small fee you can borrow an exciting new board or card game for up to a week. We’re not talking about beat up copies of Monopoly or Clue. We have some of the newest and most exciting games on the planet, including Munchkin, Apples to Apples, Arkham Horror and everyone’s favorite game of sumo wrestling hamsters, Sumo Ham Slam. There’s something for everyone! You can check out a full list of our games here. Rentals are $2 for two weeks or a yearly unlimited rental subscription is available for $20. To rent a game, simply show up at a Bacon Board Gamers meeting and speak with Mike Cross.